All of the pupils of Scoil Barra want to extend a huge ‘Thank You!’ to Andre Nation for coming to coach pupils from 4th class to 6th class over the past few months. 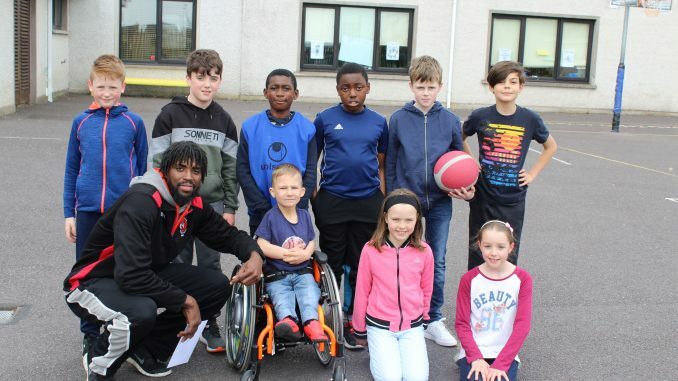 Andre is one of the stars of the very successful local basketball team in Ballincollig. The Ballincollig Division 1 Basketball team had a very successful season and they have an ever-growing number of fans here in Scoil Barra. Thanks again to Andre and to Ciaran O’ Sullivan (Ballincollig player and basketball development officer) for their continued support of basketball in Scoil Barra.